That's a difficult question without a bit more details. Can you tell us what you're planning to paint. As a general rule, use a primer onto bare plastic, followed by your top coat. Whether you need to thinker not depends on the paint. MIG/Ammo one shot primer doesn't need thinning, and is very good. Vallejo primer is horrible - avoid. Tamiya primer is good, either straight out of a rattle can, or decanted and air brushed. 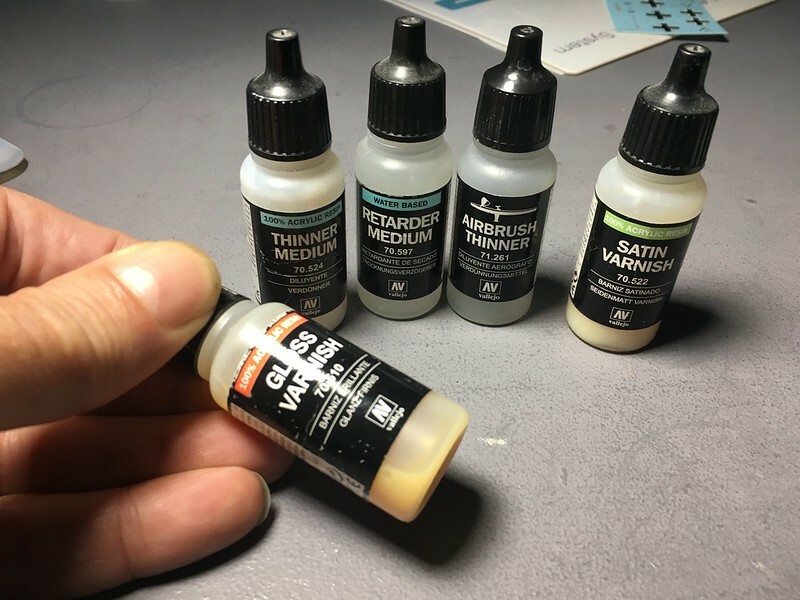 Vallejo ModelAir paints are good and don't need thinning, although they do benefit from a few drops of their airbrush thinner or just plain water. Be warned, some Vallejo products don't thin with Vallejo airbrush thinner. It's a fickle brand. Tamiya acrylic paints are excellent, and thin with about 50:50 Tamiya thinner. Mark wrote: That's a difficult question without a bit more details. Can you tell us what you're planning to paint. I mainly use Vallejo model air, I add a few drops of air brush flow improver and thinner also made by Vallejo. For a protective coat. I always give the paint several coats of gloss varnish and then if I want a satin or matt finish, then I will apply a satin or matt as the last coat. For metal parts, I use etch primer and auto spray paints out of the spray cans, but you must use auto paints in a well ventilated area, preferably not in your home (outside garage or shed) using a mask as the paints are harmful to breath in. Don't coat auto paints with auto gloss, very difficult to get right without the paint cracking after a few months. Always read and follow the instructions exactly on the cans, especially drying times in-between changing from primer to paints. Several thin coats (usually 4) are better than one thick coat. Your first 3 coats to be very patchy, only by the time you apply the fourth coat, it will be a solid colour. Vallejo do some really nice paints and model air colours flow well if you use their Retarder medium and thinner medium. I can't recommend the Gloss, I have only used this once or twice and its gone yellow I tried some and it does dry clear but I'm looking for a better alternative for the Vallejo acrylics. I also had some Gold In Model colour but again after using it once or twice it went hard in the bottle. Vallejo paints are really nice to use with a brush when thinned with a little water. Zero paints are very good and their colour matching is excellent, you do need plenty of ventilation and some PPE.